Show your fancy style by dressing up in The James Bond Tuxedo which is a perfect outfit for every occasion. 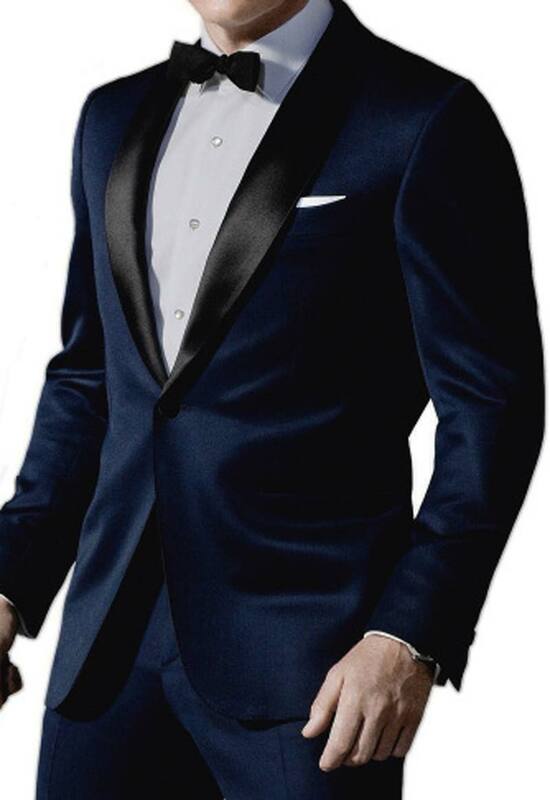 This Midnight Blue Tuxedo has premium black satin on the shawl lapel collar. It's a screen accurate design featuring exact same details as the original. Are you ready to style like Bond? Note: For made to Measure sizing, kindly fill this size sheet and email us at sales@fjackets.com after placing your order. James Bond was always the one who would make women dream that their man could dress like him. His suave and charming personality are show in the way he dresses appropriately for various occasions. Over the years, those actors who have played James Bond were lucky to put on some designer accessories and clothes. You should not be surprised when a Bond suit becomes trendy. Skyfall saw Bond go on a very dangerous mission that could have got him killed. All 007 had to do was to stop the world from knowing about agents like him even are even present. That mission goes astoundingly haywire and to make matters worse, someone from his past wants to erase him from the world. By using his superbly invented gadgets and riding in some of the coolest vehicles, he manages to succeed in completing his mission. He knows how to finish the job. Honestly, I'm impressed with the quality. I really am. 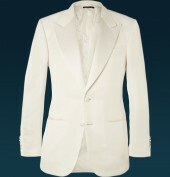 It may be a shade lighter than midnight blue, but nonetheless, the jacket is actually well-made. Warm, too. The fabric feels authentic, and the fit is slim. 9/10. I likely will order again when I can. The quality was great and it arrived super fast. Easy transaction. Luckily, I got my tuxedo just in time. I bought this for my high school prom early next year. Instead of banging my head in tension, I thought of getting it now. High-quality wear. December is around the corner, and that is when the wedding season starts. I got more than a few lined up, and I will be wearing this for all of them. I don’t bother what others have to say because I feel more relaxed in it than my steel grey suit. The biggest concern I had was the trouser fitting me. I only had the problem of trousers not fitting me because I either became fat or outgrew them. Thankfully, this lasted for more than 6 months for me. The color and the stitching didn't have any major changes in them. I wore it more than 8 times and with the amount of dry cleaning it had, i'm surprised it still looks wearable. They were after my life for the tuxedo. They just didn’t care which one I should buy but as long as it’s a tuxedo. After searching the net for 2 hours every day, I came across the most reasonably priced one. It took it 16 days to arrive because of the measurements and stuff that the store had to get right. Now when it arrived, I can happily say that it was worth the wait. Every inch of the coat was fitting me nicely as well as the length of the trouser was accurate. It’s a good place to buy the tuxedo. The quality may be good but.. The quality of the entire tuxedo is good, but the color is slightly off from the midnight blue. It should be darker than royal blue, just a bit. This tuxedo is a shade lighter than midnight blue. No doubt that it’s a great color, but I was expecting a pure midnight blue. I didn’t know an online store would sell this style of the midnight blue tuxedo. It looks lighter than expected but it fits like a glove. Well I have this girl to impress and in two days there’s going to be a prom night. I asked her out and she accepted it, but that’s not yet, I have to look good as well. So thanks to my bro he helped me to buy this piece from your site and by great hope it turned out to be good. Now I’m waiting for that moment to look even better in front of her. Thanks Fjackets for making it my purchase a success. After observing Daniel Craig’s pic with that tuxedo carefully, I believed I would look as good as him. So then I did purchase it from Fjackets and I was right. It looked perfect on me. The fitting and the shiny collar are all amazing. Now I believe I look better than the original.